Diary of a Superstar: Congratulations! Diary of a Superstar: Barbecue Tonight! Diary of a Superstar: Win Lose or Draw? Stoneywood Dyce: 210 for 6. Portcullis: 113 all out. Training sessions are in Duthie Park every Wednesday evening at 6pm throughout the season. Come along and say hello. Outdoor Practice begins on Wednesday 6th April! Portcullis CC begin their ourtdoor practice sessions from Wedneday 6th April at 6pm at Duthie Park. This will continue every Wednesday until the end of August. Portcullis are always on the lookout for new players. If you fancy giving this cricket malarkey a go why not come down and join us! We have for the first time matches on a Saturday AND a Sunday so there will be plenty of cricket for everyone. Submitted by ronnief on 3 April 2017 - 6:30pm. Portcullis Cricket Club have their Fifth Indoor Practice session of 2017 this Sunday April 2nd 2017. The practice is held at the Sheddocksley Sports Centre from 12pm till 2pm. Submitted by ronnief on 29 March 2017 - 6:37pm. Portcullis CC Host Their Fourth Indoor Practice Session of 2017. Portcullis Cricket Club have their Fourth Indoor Practice session of 2017 this Sunday March 5th 2017. The practice is held at the Sheddocksley Sports Centre from 12pm till 2pm. As always all players new and old are welcome to attend. Portcullis are constantly on the lookout for new players. We are a relaxed socialable bunch who enjoy their cricket and welcome new faces. Why not come along! Submitted by ronnief on 27 February 2017 - 6:14pm. Portcullis CC Host Their First Indoor Practice Session of 2017. Portcullis Cricket Club have their First Indoor Practice session of 2017 this Sunday. The practice is held at the Sheddocksley Sports Centre. 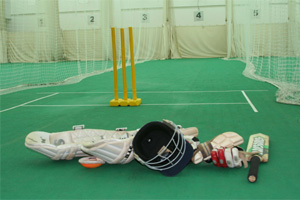 The net session runs from 12pm till 2pm. Submitted by ronnief on 9 January 2017 - 6:22pm. Portcullis Indoor Practice Dates 2017. 5th February 12pm till 2pm. 19th February 12pm till 2pm. 5th March 12pm till 2pm. 2nd April 12pm till 2pm. Submitted by ronnief on 8 December 2016 - 6:36pm. Friday the 4th of November saw the annual Grades dinner and awards with speaker Graham Thorpe and Portcullis CC were well represented. Although there was no guarantee of any silverware we had 12 players (plus Delrick's father-in-law) in attendance, if we weren't the largest group there we weren't far off. Turnout was good with a couple of hundred of Aberdeenshire's finest cricketers looking forwards to booze, banter, food, and hopefully a few laughs from a top England test cricketer. I doubt if anybody was disappointed. Submitted by Kay Pee on 11 November 2016 - 9:14pm. Mitch the Merciless Leads Portcullis to the Final. Week Ten of the 2016 Grades Season saw Portcullis relieved of their recent League duties. This week was their long awaited Semi Final clash against Stonehaven. Submitted by ronnief on 5 July 2016 - 10:19pm. Portcullis stun promotion hopefuls Siyapa. Week Eight of the Aberdeen Grades season saw Portcullis back on home turf at Duthie Park for the visit of Siyapa. Skipper Dave Mitchell lost out to his opposite number Tanveer Khan and was not surprised to be invited to bat first. Submitted by ronnief on 22 June 2016 - 3:41pm. Week Seven of the 2016 Aberdeen Grades Season saw Portcullis take to their travels to Mineralwall Park to take on Stonehaven for the first time in Grade Three. Both sides have had contrasting starts to the season so far. Stonehaven have been battling at the top of Grade Three, lying in third spot, vying for promotion with Grampian and Siyapa. Portcullis, on the other hand, have been battling at the other end of the table lying in the third bottom spot as they battle to stay in Grade Three. Submitted by ronnief on 22 June 2016 - 3:36pm. Dunecht Thunder Does For Portcullis. Week Two of the 2016 Grades season saw Portcullis finally get their league campaign underway with a home fixture to Dunecht. Week one had been disappointing as an unfit pitch was to do for the opening fixture. Submitted by ronnief on 13 May 2016 - 5:39pm.